This Time I DID Leave My Heart in San Francisco! 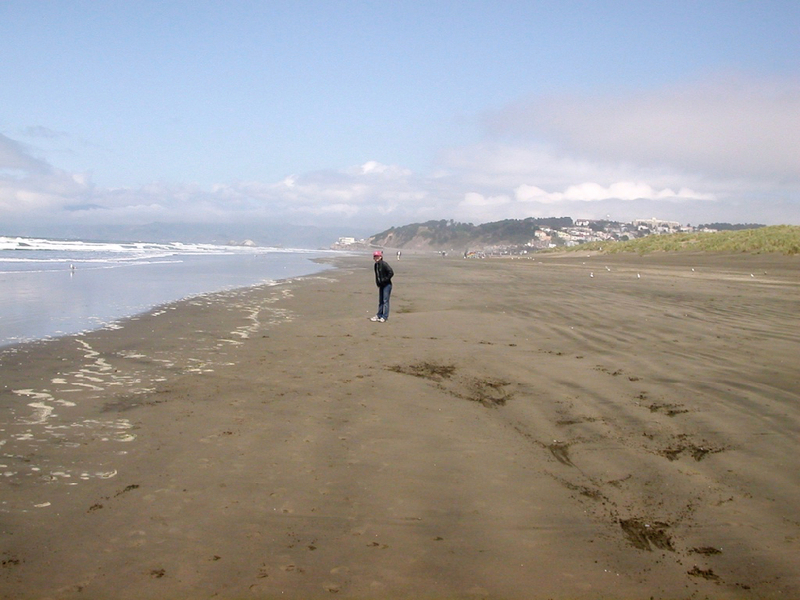 Sari & I couldn’t get out of town fast enough when we left San Francisco in September of 1999. It was the height of the high-tech bubble, and the whole town seemed obsessed with stock options. We lived in a dark, wall-to-wall carpeted railroad-flat on a sleazy, crack-ridden back alley. Our pleurisy-ridden upstairs neighbor woke us up every morning with vomiting sounds from the airshaft. We had endured two years of El Nino weather (one stretch of 55 days featured 50 days of rain) We missed our own (East) coast and were looking forward to heading back home to friends and family. I didn’t expect to think much about SF after we were gone. 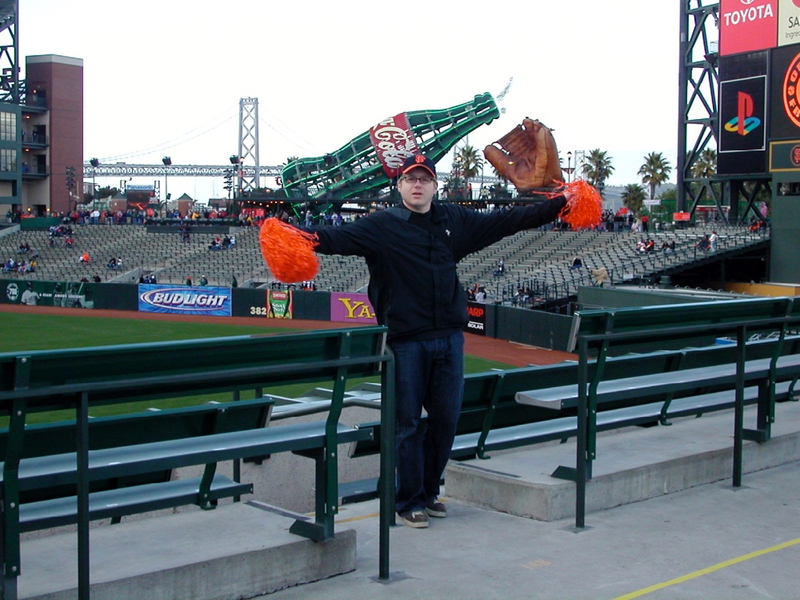 That was mostly true for a long time, but in the last year or so, I found myself reminiscing a bit, mostly about the food and my beloved baseball team, the San Francisco Giants. So when I considered going to APE this year to promote A Few Perfect Hours, I convinced Sari to come along for a mini-vacation. I also saw the Giants would be in town, and I vowed to see a game. I’ve already talked about APE, but I want to recap the good times we had on our return to the place I had spent two previous two-year stays, in the late 70s and late 90s. People always say that cities like Frisco and the Big Apple are better places to visit than live there, and I wanted to see if that was true. Plus, as New Yorkers, Sari & I love walking, and San Francisco is a great walking city. We were lucky to get pretty terrific weather for our return trip, with temps in the 60s and only one day of rain. Thursday, our first day back, we spent stumbling about in a happy daze, mostly walking through the Mission, Castro, and Noe Valley. The bursting of the Internet bubble seemed to have brought Frisco back down to Earth, and it definitely had a more laid-back, humble feeling. And after the long New York winter, it was great to be somewhere so green, with all the crazy bushes and trees that help to make the city so unique. Our first meal was a kefta kebob (with extra hot sauce and feta cheese) from Truly Mediterranean on 16th & Valencia. We took our lunch over to Dolores Park, scene of many outdoor hoops games back in the late 90s. The court was empty, so I was disappointed not to hear a welcoming call of “White Shadow” as I returned. Ah well. 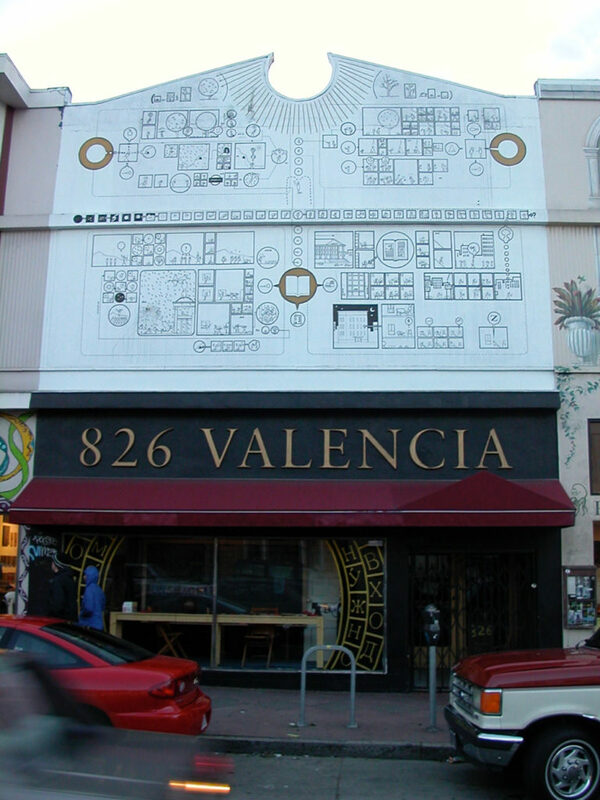 Later, walking through the Mission, we came to 826 Valencia, the site of Dave Egger’s Pirate Supply Store/tutoring center. 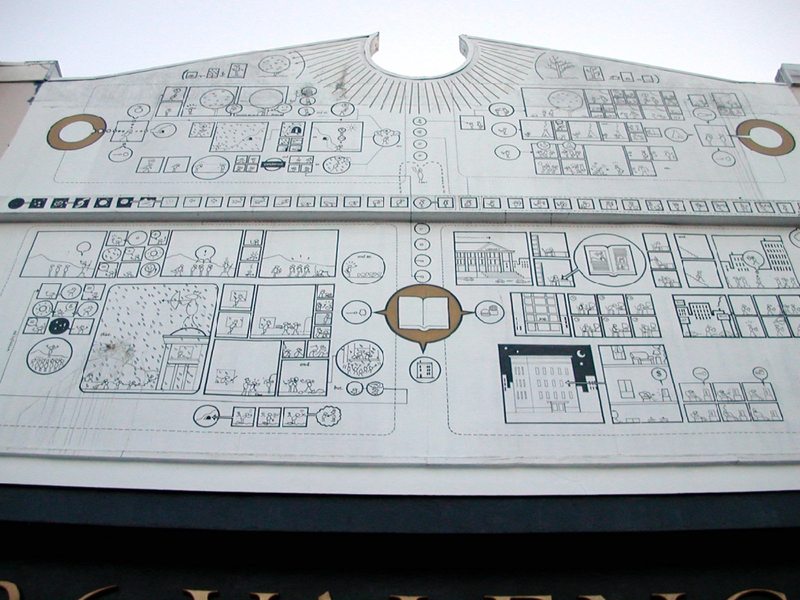 Check out the amazing cornice, designed and executed by Chris Ware. Dinner was at Fuzio, a fusion restaurant on Castro that I used to love. The firecracker pork is still the best dish there—besides me, I think 75% of the other diners were feasting on it. Sari & I noted happily that none of the prices seemed to have risen for any of the area restaurants. The next day, Friday, was another day of exploring. 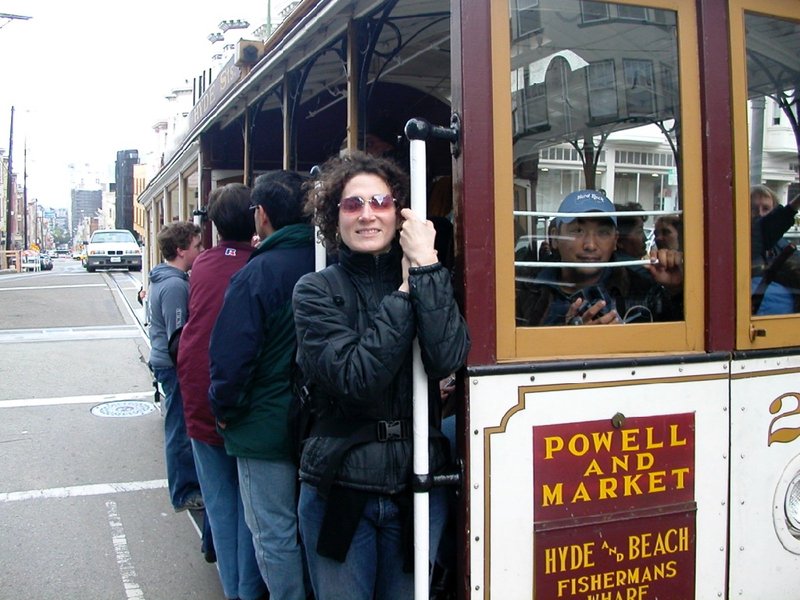 We set out from our downtown hotel and headed through the sleazy blocks of Market down to the Powell Street cable car. Who can resist this tourist staple, especially when one ride whisks you all the way from downtown to the wharfs through all the fun ups-and-downs of Russian Hill? For lunch I enjoyed the sublime taste of an In-and-Out Burger; while Sari chowed down on a fresh clam chowder and a crab cocktail. 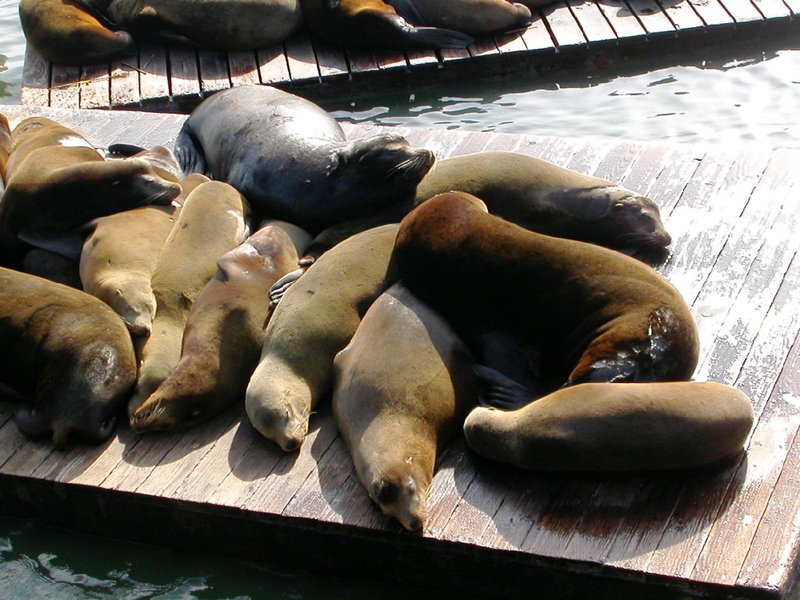 Then it was time to enjoy the sea lions who have taken residence on Fisherman’s Wharf. We can’t get enough of their barking, grunting, and growling. They all want to plop their sluglike bodies in the sun, to achieve perfect lazy indolence, but they incessantly piss each other off with their constant moving, shifting, and splashing. The best part of the day approached as we made our way to SBC Park for the Giants game. I had spent close to $100 for tickets earlier and I couldn’t wait to experience the park for the first time. It’s one of these new red brick “retro” parks, built right on the water, and it didn’t exist when we last lived in the city. 66 on the radar gun! The park was everything I had imagined, and we spent a half hour or so just walking around, admiring the views, the intimate seating, and the various food options. 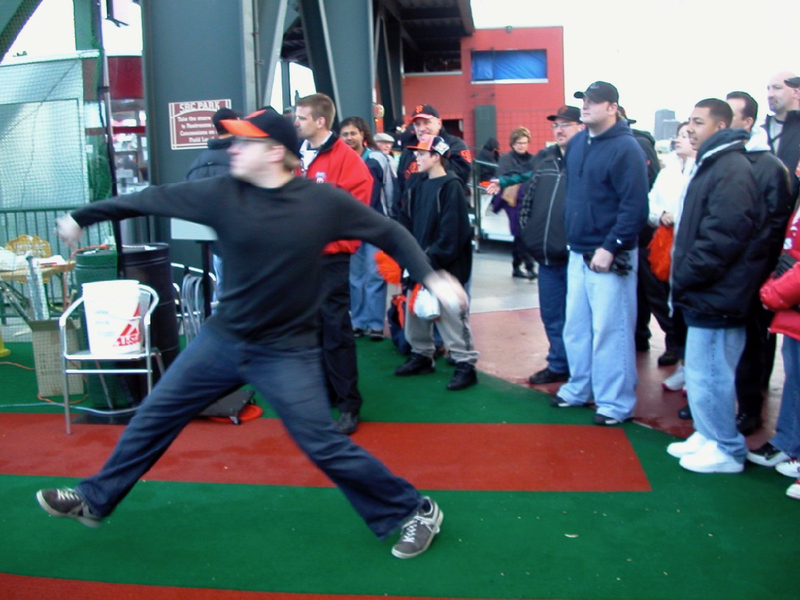 I even tried my hand at the Speed Pitch, where you try to throw three strikes and find out the speed of your throws. I’m ashamed to say I only reached 66 mph on the radar gun, not even as fast as the slowest curveball of your average major leaguer. I was sure I would have been able to hit at least 70! Guh. But the evening was made perfect by a GREAT baseball game (augmented with the classic garlic fries unique to Giants games). The Giants went out ahead early, coasting to a 6-0 lead. But then in the 7th, the Rockies scored an incredible 8 runs, sending me and the other fans into a funk. The Giants scratched back for a run in the 8th but were still down 8-7 entering the bottom of the ninth and their last at-bats. The game was tense and people were standing to get the best views. This one drunken lout behind us kept yelling “down in front,” but if I sat, my view would have been blocked by the folks in front of me. Finally, he resorted to, “Sit down, Four Eyes!” which is brilliant on so many levels—but still didn’t work. Ultimately, the Giants got their first two batters on base and then that evening’s hero Marquis Grissom hit a walk-off three-run homer to win the game and send us home in ecstatic fashion. The drunk dude behind me (standing by this time like everyone else) was the first one to swat me a prodigious high-five, which Sari thought was hilarious considering he had been attempting to insult me moments before. Such is sports. As we left and the rain began in earnest, we took one last tour of the outside of the stadium. We passed the open area in the right field fence and peeked through onto the field to see it and the stands covered with scavenging seagulls, cleaning up all the food debris left over after the game. We realized that the birds knew just when the game would be ending, and probably showed up every game night around that time. Peering at them through the rain, it was simultaneously eerie and amusing. Symbiosis is a fascinating phenomenon. Saturday and Sunday were mostly devoted to APE, except for the evenings. Saturday night Sari and I hit the pavement again, as we walked from our hotel to Chinatown. Sari had expressed interest in checking out the Tenderloin, which we found as seedy as ever. We walked right by someone injecting a needle into his wrist, with blood streaming out of the wound. Nice. We got to Chinatown relatively unscathed, and after purchasing a delicious steamed pork bun, we ended up at The House of Nanking. Their Nanking Chicken, deep fried with yams, is unforgettable. I was impressed with my ability to find my way through the crazy streets of North Beach/Chinatown to the right location, as we had only been there once before, many years ago. We also made a stop at the great bookstore City Lights, where I left a copy of my book for them to considering ordering. Sunday night was spent with a distant cousin (a contra-bassoonist with the San Francisco Symphony) and his wife. We had dinner at Suriya and partook of their sublime pumpkin curry. We had dessert at my cousin’s house in Noe Valley, which was a nice break from the hotel/restaurant circuit. Our last full day in Frisco was another pedestrian extravaganza, as we started out at Ocean Beach, in the Sunset, and walked all the way back into the heart of the city, through the entire length of Golden Gate Park, up into the Haight, through Buena Vista Park, down into the Castro, and finally back to the Mission for dinner. 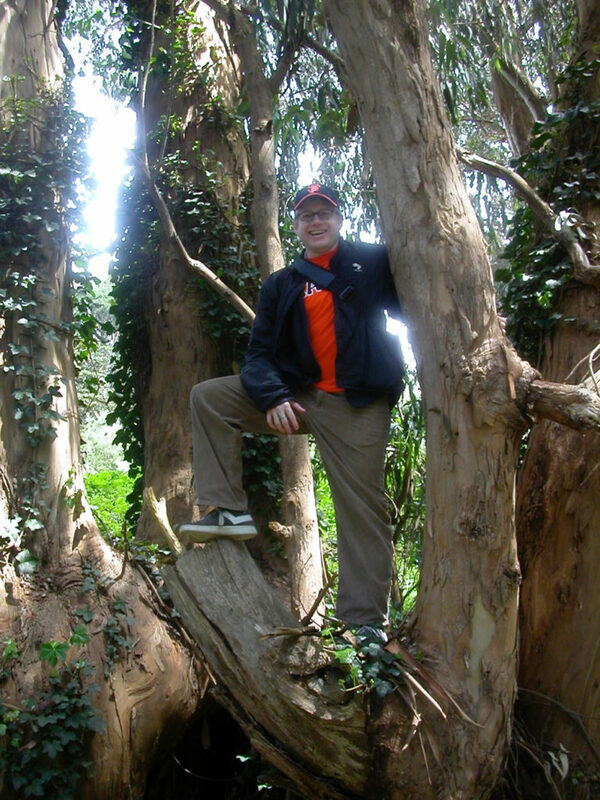 It was a great sunny day and we got the most of the great outdoors, from wind and seaspray to the tang of eucalyptus. We had lunch in the Haight at a brewpub called Magnolia, with a terrific, friendly and informative waitress. I bought a new pair of Converse sneaks, and on the advice of the salesman, left my old pair on the sidewalk for someone else to make use of. 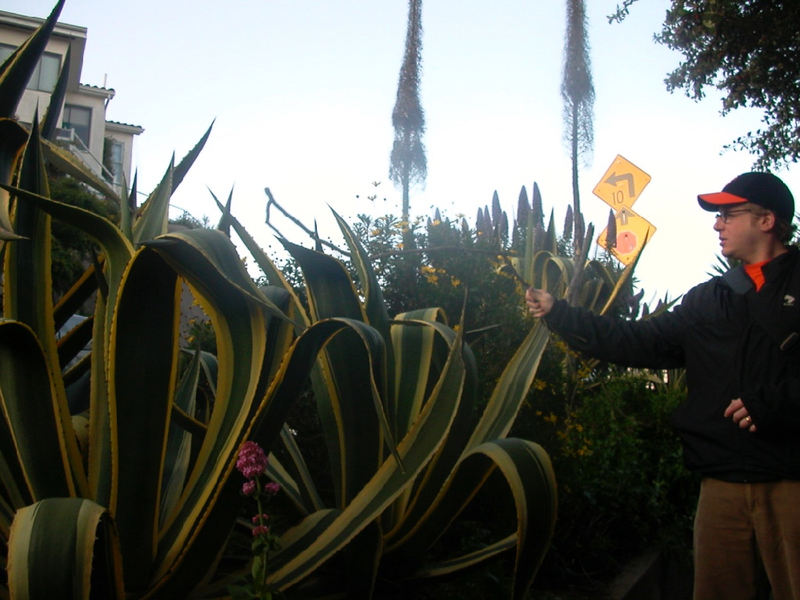 And we finished our walk through gorgeous, hilly Buena Vista Park by meandering through the streets and back gardens of Vulcan down into the heart of the Castro. So cool. Finally, we had a classic Bay Area burrito dinner in the Mission before we took the streetcar back to the hotel. San Francisco really seems to have returned to its roots, to the kind of laid-back progressive place I remembered from my childhood in the late 70s. It’s too bad it had to be associated with an economics downturn, but anything is better than the status-oriented, money-grubbing place of the late 90s. This wasn’t just our half-baked impression, either, but was confirmed by pretty much everyone we talked to who currently lives there, from our old neighbor (pleurisy seems better), to Justin Hall at APE, to my cousin. The next morning we checked out of the hotel, slung on our packs and hitched BART down to SFO for the long flight back home. We had enjoyed a great little vacation and finally gotten the bad taste of the Internet-bubble San Francisco out of our mouths. Nice to have a clean palette for whatever comes along next. Did you get the smackdown from anyone for using the word “Frisco”? Within 3 minutes of arriving there on a visit about 7-8 years ago I was chastised, quite strenuously, by a cab driver on this important point. Totally. Every “real” San Franciscan hates that term. Which is why I love to use it — they always get so riled up. What the hell’s wrong with “Frisco” anyway???? Fantastic. I love your travel tales. I think you have a faster arm than me. I shudder to learn what my hurl would clock. The Pirate Supply Store! Ooo! Ooo! I want to go just so I can see it.